Winner President’s Award 2018 is Andras Lakezi, Food and Drink Manager of the Kimpton Fitzroy Hotel. As part of the Award. Andras will receive invitations to attend up to five Gastronome events, opportunities for a range of development activities plus mentoring and networking opportunities for two years. 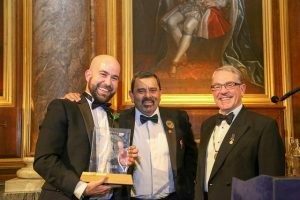 The President Wallace Vincent (right) joins Cyrus Todiwala (center) to present the Winner’s trophy to Andras Lakezi, winner of the President’s Award 2018. Arrangements are now in hand for the President’s Award 2019 and the launch date will be announced shortly.